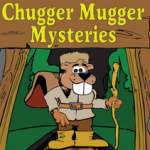 In this Chugger Mugger mystery, Josephine, Jake, and Chopper, travel back in time to the year 1921. The Canadian fishing and racing schooner, The Bluenose, is about to be launched in Halifax, Nova Scotia. These three experience the sights of the Great Canadian Race before they realize Fineus Fitch plans to blow up The Bluenose. 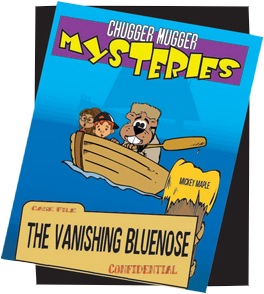 It is up to the Chugger Mugger Mystery Team to save the famous schooner from a Fineus Flitch Bomb. This full colour trade paperback book is 56 Pages long. 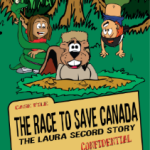 The book is formatted like a comic book with full-page “Beaver Tales” fact sheets containing information about select Canadian history topics relating to the book. 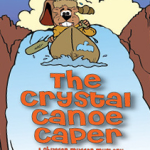 This novel teaches kids about the famous Canadian fishing and racing schooner, the Bluenose, the Tree of Life, the Great Canadian Race, and Nova Scotia. 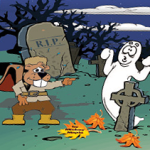 Each of these four topics come with a short “Beaver Tales” fact page to give readers some extra information. This is the print edition of "The Vanishing Bluenose." The book is full colour and 56 pages long. This is the digital edition of "The Vanishing Bluenose." The book is full colour and 56 pages long. All eBook downloads include a MOBI for Kindle, an EPUB for most other eReaders, including the Sony, the Nook, and the Kobo, and a PDF version of the book so it can be read on any eReader as well as on the computer.